Jihad Watch : The U.S. has not been bombing in Bangladesh, but of course he doesn’t mean Bangladesh. He means the Islamic State caliphate, allegiance to which transcends all other earthly allegiances. The would-be suicide bomber who detonated an explosive device underground near the bustling Port Authority Bus Terminal is a former New York City cab driver who told investigators that he was inspired by ISIS to carry out the attack for revenge, law enforcement sources said. Akayed Ullah, 27, who is believed to be from Bangladesh and was living in Brooklyn, told authorities in sum and substance from his hospital bed: “They’ve been bombing in my country and I wanted to do damage here,” sources said. He told cops he was inspired by ISIS, but police don’t believe he had any direct contact with the group, sources said. Ullah, who officials say is a former city cab driver whose license has lapsed, set off a “low-tech” homemade pipe bomb strapped to his midsection around 7:20 a.m. inside the subway passageway between West 42nd Street and Eighth Avenue and West 42nd Street and Seventh Avenue…. 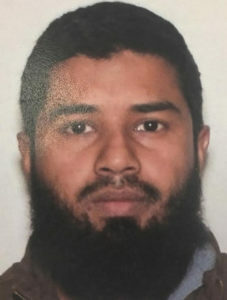 Ullah, who had the explosive device affixed to him with Velcro and zip ties, suffered burns to his hands and abdomen, along with lacerations, and injured three others who were in proximity to him. He was ​quickly taken into custody and ​transported ​to Bellevue Hospital.